Want to have a memorable vacation? Opt for Heritage Hotels in Taragarh through Heritage Hotels of India. One of such property is Taragarh Palace. 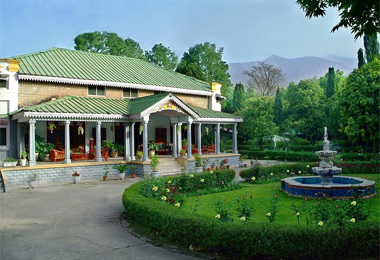 Located in the foothills of Dhauladhar Mountains in Himalayas, Taragarh in Himachal Pradesh is a mesmerizing residential estate that belongs to the royal family of the erstwhile princely state of Jammu-Kashmir. The interiors of the property ooze out classical charm while the rooms are well-appointed with period furnishings and wide façade. Since the hotel is at a height of 3400 feet it, you can have a spectacular view of the surroundings and the snow-covered peaks. This off-beat hill town proves to be an amazing destination for a vacation. The guest rooms here have been divided into rooms and suites-spacious, luxurious and well-equipped with every modern facility such as attached bathrooms, plush furniture, tea/coffee maker and more. During your stay, you will enjoy flawless services of the hotel staff. The dining options are simply amazing where you can relish sumptuous delicacies of India and a few global cuisines. In the course of your vacation here, along with sightseeing, you can also indulge in trekking, angling, nature walks and so on.